I really loved this book. The atmosphere and the characters and the magic of it all were just so evocative and lovely. It was a pretty slow book, not high on the magic/adventure, and it's largely a character piece that spends a lot of time mired in magical allegories for depression/assault, but I also really felt the depression angle hard and I...it's weird to say I loved it but I did. The relationships in this book were pretty snazzy. Livy and Skye's connection as sisters and their interdependence on each other is a big part of it, and I really felt their love for each other. Livy and Kit developing a budding romance was well-done, and I loved their level of communication and consent and just all around cuteness. Skye and Grady were really fucked up (and here is the CW for magically-induced lust and all the consent issues that brings with it) and yet...it's openly acknowledged as such and around that parts of it were still really sweet? IDK, that one's still hard for me to parse, but all the other bits were great. 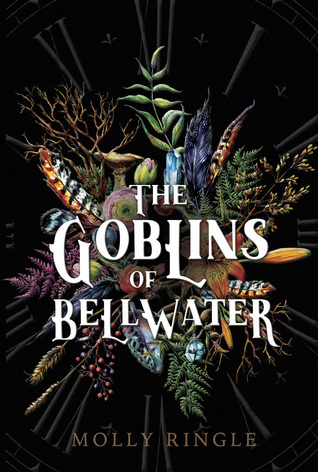 The goblins especially I loved for being so thoroughly unhuman and marvelously wicked. I honestly loved how little explanation we got for them. There was a ton of backstory on their connection to Kit, but very little about them as a 'species,' and it made them feel all the more magical and mysterious as a result. We learned enough to be properly scared of them, and that was plenty. The only part that didn't hit home for me was the ending, where a very slow and introspective book suddenly tried to have an action ending. A lot of the second half of the story was 'oh, how do we break the curse' and...let's not get spoilery and just say I wasn't satisfied. Nothing that they considered in their 'how to break it' phase actually affected the ending, and I like my mysteries to be more cause-and-effect than that.